I rescued this poor little doll from a bin of toys in a local thrift shop. She just looked old to me. Did a little research and think she may be a Read and Play creation, lovely Alice. She has no marks on her neck or anywhere else I can find. She is small, @8" tall. She is plastic and her head (which looks like it is held on with a rubber band,) eyes, and arms are moveable. Her legs are not. The hair in the back of her head is missing. Her dress is faded and her apron is dirty. She has black shoes painted on her feet. It looks like her underwear has been stapled on. 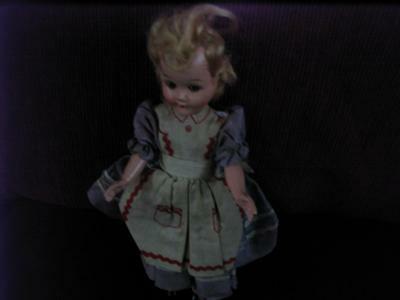 She is such a pretty little doll I hope I can find someone to restore her. If not, she can serve as a history lesson to my grandchildren. Read & Play Creation "Alice and her Books", the first of twelve doll and book sets. She was packaged with a small Wonder Book in a window box. The outfits were not removable and yes, jointed head and arms only with sleep eyes. Patent filed in 1951, by 1952 they had released all twelve dolls. The series included Heidi, Peter Pan, Come Visit My Ranch, The Surprise Doll and Playtime for Nancy.